Roller coaster rides and winding waterslides are a major thrill for big kids. When it comes to sites that offer an admirable range of attractions geared toward young children with less bravado and shorter stamina, however, some theme parks really stand out. Plan a trip to one of these kids amusement parks for your next getaway with little ones. 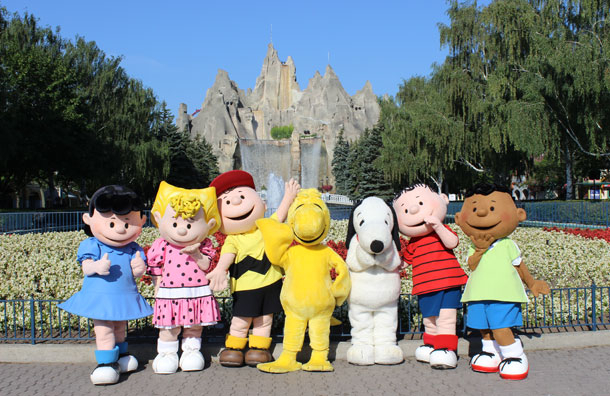 With the addition of kid-friendly Planet Snoopy in 2010, Canada's Wonderland in Vaughn, Ontario, just outside of Toronto, became friendlier than ever for families. Along with Kidsville, a dedicated area for little ones that debuted in 1998, Planet Snoopy welcomes pre-schoolers with tyke-friendly characters, entertainment and special rides scaled to size. Two Baby Care centers, stroller rentals and kid-friendly dining options cater to families with small children. Sheraton Parkway Toronto North Hotel & Suites is convenient to Canada's Wonderland, and offers an outdoor saltwater pool and Wonderland stay-and play-packages. Busch Gardens Williamsburg - Williamsburg, Va. Featuring nearly 20 KIDsiterate activities and attractions that young children can enjoy, including animal encounters, high-energy shows and themed rides in Sesame Street Forest of Fun and Land of the Dragons, Busch Gardens Williamsburg is a great destination for families with children of all ages. At the height check station, children receive wristbands that are color-coded to correspond to the rides they can enjoy. Family restrooms, two nursing rooms, a child ride swap program and a generous selection of kid-sized meals make it easy for mom and dad to relax and have fun, too. Located just a mile from Busch Gardens, Courtyard Williamsburg Busch Gardens Area features an indoor/outdoor pool and one-bedroom suites with a separate living room. Story Land - Glen, N.H.
You'll get a big bang for your family buck at Story Land, a small-scale kids amusement park that is perfect for the pre-school set. Most of the rides at the White Mountains, New Hampshire area attraction are geared towards children ages 7 and under, such as Alice's Tea Cup and Whirling Whales. Reserved stroller parking, VIP nursing and baby changing rooms, free pet kennels and free parking in an accessible lot make it especially family-friendly. For the whole crew, there's a fun raft ride and Roar-o-Saurus, a roller coaster the whole family will love. Enter the park during the last three hours of operation (schedule varies seasonally) and receive complimentary admission the following day. 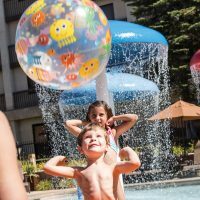 Seven miles from Story Land in North Conway, New Hampshire, the Red Jacket Mountain View Resort features an awesome indoor water park and Story Land packages. Idlewild & SoakZone - Ligonier, Pa. Located just one hour outside of Pittsburgh, Idlewild & SoakZone features nearly a dozen rides for little ones in Raccoon Lagoon, plus coasters and classic rides that pack plenty of thrilling punch for the older ones. Kids can blow off steam in Jumpin' Jungle and SoakZone, with dry and wet play areas that offer tons of choices for hands-on physical fun. Characters come to life in Story Book Forest, and a trolley rides through Mr. Rogers beloved Daniel Tiger's Neighborhood. Fun Day Admission/Meal Deal passes include a meal voucher, good for your choice of a sandwich, hot dog or salad, plus chips and a beverage at participating outlets. Parking is free and strollers may be rented in advance online. Located just 11 minutes from the park, Wingate by Wyndham Latrobe is a good family lodging option, with complimentary breakfast and free Wi-Fi. Boasting 17 electrifying roller coasters, Ohio's Cedar Point is thrill ride central, but did you know that it's also home to some of the most tot-friendly rides and attractions around? Offering four areas specifically designed for children, this mega theme park is major fun for little kids. Pre-schoolers will have a blast in Kiddy Kingdom, a self-contained play land filled with pint-sized rides they can board and steer themselves, including car and airplane rides and a carousel. Fitting for adventurers up to early elementary age, Camp Snoopy lures pint-sized Charlie Brown fans with cartoonish people movers, from a giant school bus to a submarine. When hunger strikes, families have a host of familiar choices, from Chick-Fil-A to Dairy Queen. The kids amusement park features two Family Care Centers, both with baby changing and private nursing stations, a Kid Track safety system and a Parent Swap option, the latter of which allows parents to take a turn enjoying the big rides without a major wait. Right on the park property, recently redesigned Hotel Breakers features family-friendly sleeping set-ups, children's play areas and early theme park access. Dutch Wonderland - Lancaster, Pa.
Refreshingly old-fashioned and set in Amish Country, Dutch Wonderland in Lancaster, Pennsylvania, is a great fit for families looking for a wholesome getaway. Featuring more than two-dozen preschooler-friendly rides and attractions, plus a dedicated water play area and a no-alcohol policy, this theme park really rolls out the red carpet for families with small children. Dining options include familiar chains like Subway and Nathan's Famous, and when it's snack time, kids can cool off with Dippin' Dots and frozen Dole Whip. Convenient to Dutch Wonderland, Eden Resort & Suites, BW Premier Collection offers indoor and outdoor resort-style pools; an outdoor recreation area with a water spray park; a playground and sports courts; family villas with full kitchens; and daily buffets with pizza and other kid-friendly foods. The central Florida kids amusement park of choice is Walt Disney World's Magic Kingdom combines the elements of fantasy and magic with character encounters, exciting rides and shows staged by professional entertainers. In the recently re-imagined Fantasyland, kids can soar high with Dumbo, take a journey under the sea with the Little Mermaid and meet their favorite Disney idols. A Rider Switch program allows parents to enjoy rides that are too mature for little ones, without the wait, while a special behind-the-scenes Family Magic Tour is just right for the early elementary set. A Baby Care Center, located on Main Street, U.S.A. has special feeding areas, changing tables and a family waiting area where older children can watch videos while mom and dad take care of the baby. A special resort guide just for preschoolers can be found on Disney's website, and offers a comprehensive list of kid-friendly attractions, sample touring itineraries and travel tips. A short walk (or stroller ride) to the Magic Kingdom, Disney's Contemporary Resort takes the cake for convenience, allowing guests to return to lodging easily for a mid-day nap. The West Coast counterpart to Disney's Magic Kingdom Park, Disneyland holds the title of Walt Disney's first and original theme park in Anaheim, California. Due to its smaller size and scope as compared to its Florida sister, it tends to be easier to navigate for families with small children. Classic ride highlights for the pre-school set include the Many Adventures of Winnie the Pooh, Peter Pan's Flight, King Arthur Carrousel and Dumbo the Flying Elephant. Visits to Mickey and Minnie's homes in Toontown and the Enchanted Tiki Room in Adventureland are obligatory for faithful fans. A Baby Center, located on Main Street, U.S.A., offers diapers and changing and feeding areas. Convenient to Disneyland and offering and early theme park entry and an onsite character dining experience, the Disneyland Hotel features guestrooms with special Disney touches, themed suites and a kid-friendly pool and water play area. LEGOLAND Florida - Winter Haven, Fla.
You don't have to be a LEGO fanatic (though it certainly doesn't hurt) to enjoy a day at LEGOLAND Florida in Winter Haven, Florida. Attractions are geared toward children ages 2 through 12, and families will find a nice variety for both preschool and elementary-age children. In DUPLO Valley, toddlers can build, splash and play in a comfortable, safe environment, while in LEGO City, kids ages 3 to 5 and 6 to 13 can earn their official LEGOLAND drivers' license at junior and senior driving schools. In Fun Town and Land of Adventure, the whole family can create their own mini-figures, watch a 4D movie, explore hidden tombs and ride a scaled-to-size LEGO dinosaur themed roller coaster. The LEGO World of Chima brings visitors up close with favorite characters, from Laval the Lion Prince to Cragger the Crocodile King. For an added fee, visitors can combine a full day at the theme park with LEGOLAND Water Park admission. Like the theme park, LEGOLAND Water Park offers fun activities for toddlers, as well as school-aged children. A second U.S. LEGOLAND park and LEGOLAND Hotel are situated in Carlsbad, California. 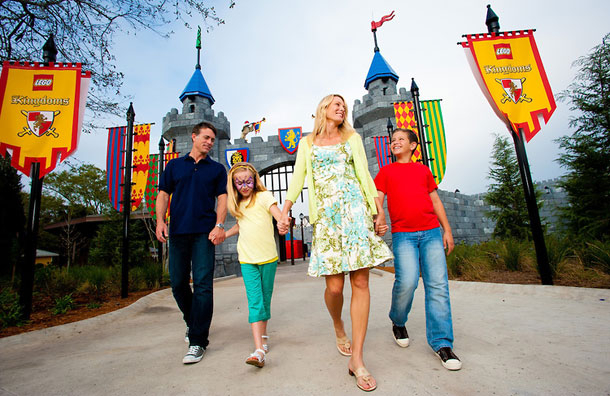 Opened in 2015 and just steps away from the park, LEGOLAND Florida Hotel features themed rooms that sleep five with bunk beds and trundle beds, complimentary breakfast, in-room treasure hunts and early LEGOLAND theme park entry. Set in a city that offers a sea of terrific family-friendly theme parks, SeaWorld Orlando is a great option for families seeking an easy-going experience that just happens to be educational. In Shamu's Happy Harbor, little ones can splash with fish, take a tugboat ride and navigate tunnels and giant climbing nets. Spectacular shows and animal encounters provide at least a day's worth of entertainment for the entire family. Families can dine with Shamu and Santa Claus (seasonally) or enjoy instant food by ordering a pizza ahead of time via Express Dine Ahead service. Seasonal offerings like a holiday ice show and Halloween trick-or-treating are appropriate for young children. Additional SeaWorld parks in San Antonio, Texas, and San Diego, California, offer similar kid-friendly appeal. Within easy walking distance to SeaWorld Orlando, the Renaissance Orlando Resort at SeaWorld features an extensive outdoor pool complex with a water park, kid-friendly dining options like Saturday breakfast with Shamu, and special SeaWorld partner privileges, such as early theme park entry (select dates only) and complimentary Quick Queue passes. 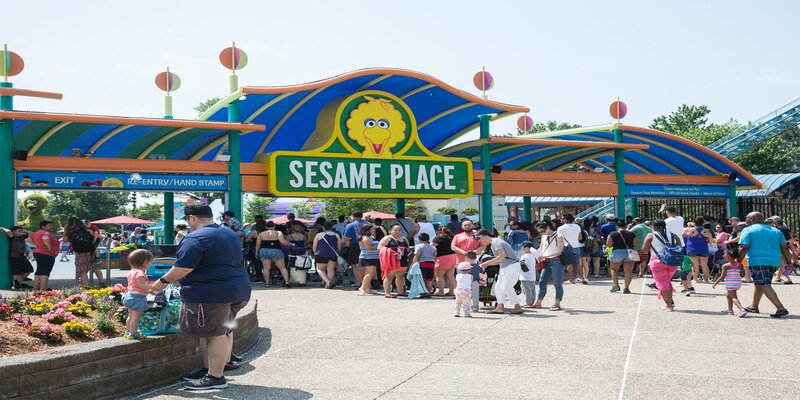 Sesame Place - Langhorne, Pa.
You can count on a wholesome G-rated day at Sesame Place, a super-cute kids amusement park featuring scaled-to-size rides, shows and favorite characters from the popular PBS children's show. A musical starring Elmo, a daily character parade and wet and dry areas offer plenty to keep the kids engaged. For young daredevils, the Vapor Trail roller coaster features gentle twists, turns and the opportunity to earn bragging rights back home. Sesame Place is located in Bucks County, Pennsylvania, just outside of Philadelphia. SpringHill Suites Philadelphia Langhorne is a short walk to Sesame Place by private path. This family-friendly hotel features complimentary breakfast, an indoor swimming pool and a seasonal children's play room. It also offers package deals.